Be the first to know about tornadoes, floods, shootings, riots, looting, protests, hurricanes, earthquakes, bombings, terrorist and crime waves happening near you. 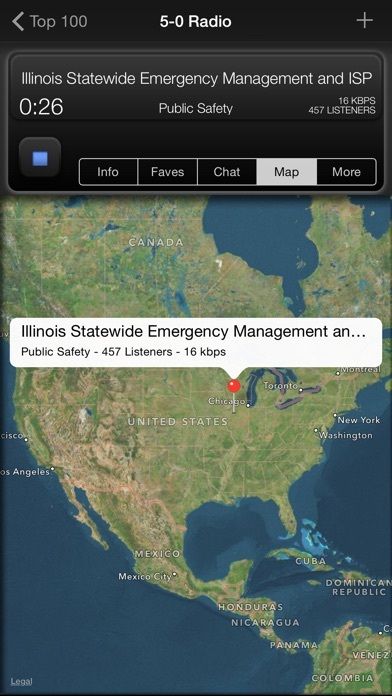 Join the tens of thousands of new users daily and tap into over 50,000 live police, firefighter, emergency medical ambulance, emt, air traffic control (ATC), railroad, ham radio, NOAA weather, news, talk, sports, and music stations. * Why Upgrade to Pro? * - Adds More Feeds - Removes Ads - Record Feeds and Email Recordings - Sleep Timer / Alarm - Siren Noise maker - Access to cool new backgrounds - Even more Airport feeds - Even more Railroad feeds - Even more NOAA weather feeds - Get new feature updates + More "Hot App of the Day" - Appmodo As seen on NPR, CNN, New York Times, 9to5 Mac, MacWorld, Wired Magazine, and various other news organizations. Listen to real events happening live in other parts of the world or in your local town. 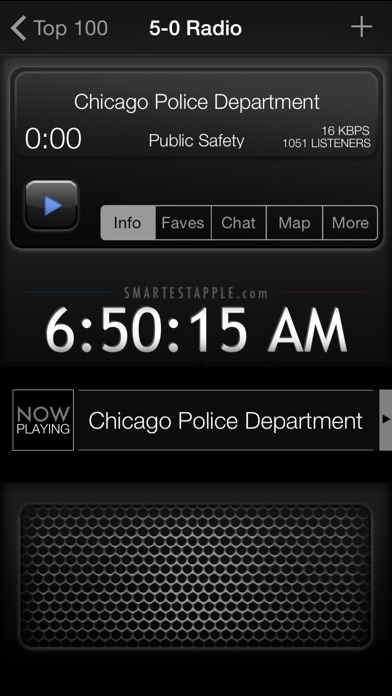 Listen to radio chatter in the background while you run other apps. Listen to new music as you surf the web. Share the stations you are listening to with your friends. They do not need to buy this app to listen to the feeds that you share with them. * Features * - Listen to feeds in the background while you run other apps or write emails/text messages. - Chat with other listeners in real time. - International support. There are feeds in many parts of the world, including USA, Canada, Australia, Chile, Russia, Japan, Sweden, UK, Israel, Europe, and more. - Automatically attempts to reconnect the feed if you lose the connection. - Browse one of the largest collection of feeds you will ever find in the App Store. 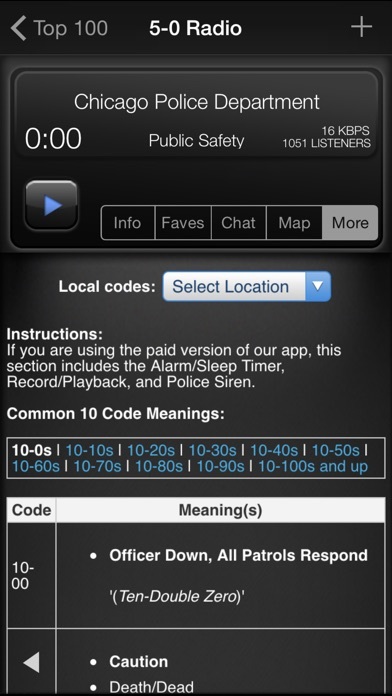 - Search through the feeds with any keywords (enter your city name to find local radio stations). - Browse through radio feeds by genre (Police, Railroad, Rock, Pop, Hip-Hop, R & B, etc.) - Customizable Interface. Download new skins for free or create your skins. - Integrated map finds your location and the location of most scanner feeds. - List the Top 100 most-current-listeners feeds so that you wouldn't miss an important event - The catalog is instantly updated as soon as you start browsing it, with new feeds added every few hours. - Built-in Web Browser; so that you can browse the web while using this app. The built-in web browser is a powerful browser that can block ads. - Use the built-in web browser to browse the web for more feeds such as air traffic control feeds, weather, and railroad. - Search for air traffic control feeds by the airport code (i.e. LAX, JFK, HKG). - Share feeds to your friends by email. All they need is a computer or iPhone to listen to your feeds. - Listen to feeds on your own desktop computer or laptop. Just email a link to the feed to yourself and open it with iTunes. 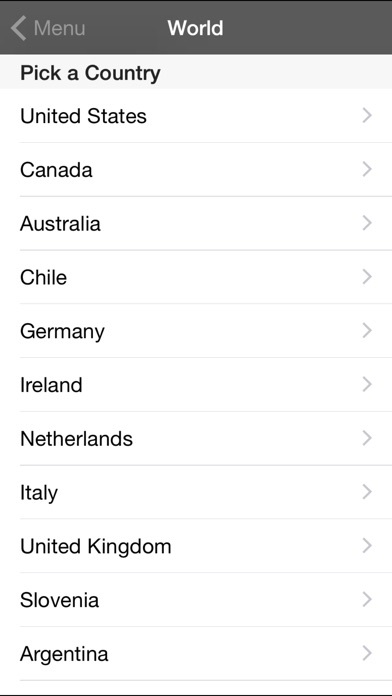 - You location not listed here? Add your own feeds. There are plenty of feeds on the internet. Now you can add them all to one app. - Your favorite feeds show up as soon as you start the app, and they can be sorted/edited by you. Feed Requests Want to make a feed request? Go to http://SmartestApple.com for more information on how to do so. I knew police did big stuff, of course, but I suppose I hadn’t given much thought to the bazillion “little” things they do every day and night. Hundreds of calls a week to check this or that false alarm out; to respond to a person complaining of UFOs; or “he hit me” but when they get there the person says they didn’t mean they actually *hit* them, they were just mad. And so many calls come in that are cancelled, after the police have spent the time driving there. I already respected them, but now I have a better appreciation for what their stress must be like. Also, comparing my city to some others, I can see that my local police are organized and professional while some other cities the cops are silly and chatter like they’re around the water cooler. I feel grateful to be in my city where I feel like cops are paying attention! I have tried the others, this is the best. Perhaps one day this application will come in handy. It’s kinda interesting picking different cities. Some cities have nothing making me wondering if we got the correct frequency. Boulder is low, Denver busy, Reno very busy. It’s fun and easy. Nice UI and stable. Thx for the hard work. 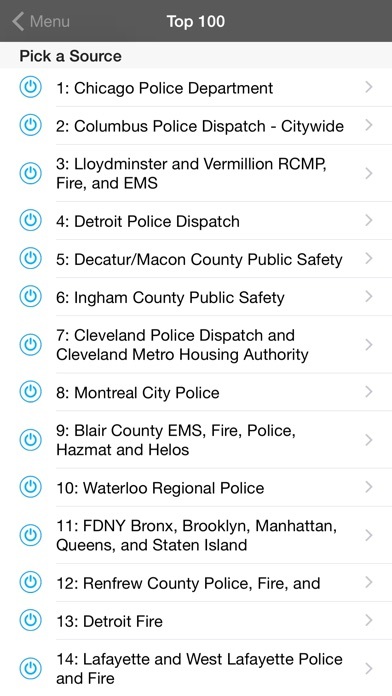 5-0 Radio Pro is a great app how ever in my area of Charlottesville VA there is only the dispatch channel for fire and rescue so once dispatched they go to different channels which you can not hear or pick up. Also only the State police and Albemarle fire and rescue are available. But good and clear audio. As a police officer I use it steaming through the stereo in my squad car to monitor surrounding agencies. Only complaint is it tends to crash fairly often. Other than that, great app.